January | 2013 | Arthur in the Garden. 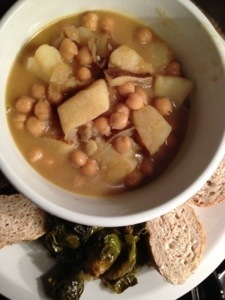 Chickpea and potato curry with roasted Brussel sprouts. Every Saturday we eat at a little Indian Restaurant on Hillsborough Street in Raleigh, North Carolina. It has influenced my cooking very much. I have always loved spicy food. I love Mexican and Thai foods. Anything with a spicy pizazz! Thank goodness a Penzy’s Spices has opened in Cameron Village! I could live on potatoes alone! I like them roasted, baked, fried, and stewed. They lend substance to thin stews as the starch will thicken anything! 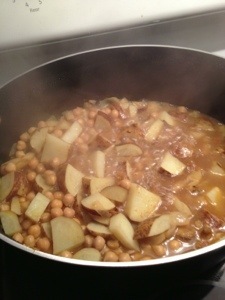 Potatoes are called Aloo in Indian cooking. Chickpeas are just as wonderful and useful as potatoes. They are used worldwide to make everything from hummus, vegan burgers, and many Indian dishes. Indians call them chana. Spanish call them garbanzo beans. You can mash them into a paste or leave the whole. They have a nutty flavor and are the best for adding healthy protein to your diet. On the side, we had Brussel sprouts roasted with lemon and garlic. The lemon juice was a perfect complement for the sprouts as I don’t like that cabbage taste. A few slices of Italian bread rounded out the plate. The recipe called for a can of tomatoes, too, but I left them out. 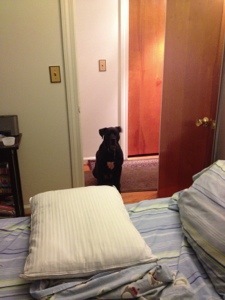 Meanwhile, Gus was waiting for me to make the bed so he would have a warm place to nap! He did not have to wait long! 1 In a large pot, heat the butter over medium-high heat and sauté the onions and ginger until the onion begins to brown, about 4-5 minutes. Add the salt, cumin, coriander and cayenne, stir to combine and cook for another minute or two. 2 Add the remaining ingredients, stir to mix and simmer vigorously for about 35 minutes, or until the potatoes are tender. Add more salt to taste. Serve the curry in bowls over rice. 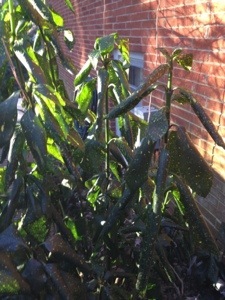 Why do leaves of most plants curl when it’s cold? Last night was the coldest night so far this winter. It was 24f this morning. 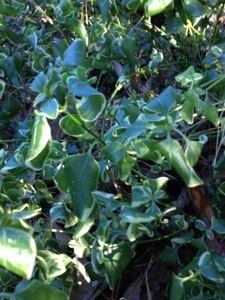 When the temperatures are this low many plants have the unusual response of curling their leaves. This is known as a thermotropic response. There are many theories to why some plants do this: 1) Photo inhibition to reduce winter damage from radiation, 2) heat balance theory to maintain temperature, 3) freezing damage theory to prevent damage from rapid thawing after freezing, 4) mechanical theory to prevent damage to the leaf, and 5) desiccation theory to prevent the leaf from drying out are all theories as to why leaves curl in cold weather. 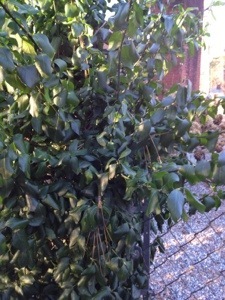 The chain link fence which runs around the entire half-acre was planted by the previous owner with wintercreeper and is now covered and trimmed to resemble a hedge. The previous owner, who lived in the house for thirty years, did this many years ago and I thank her. 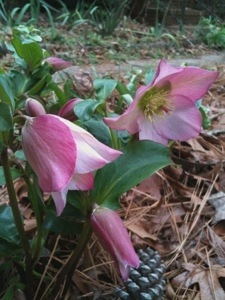 Spring in the winter. 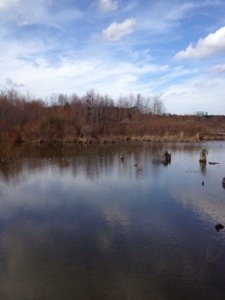 A walk along Capital Swamp Greenway. The weekend weather was spectacular with temperatures in the 70s! 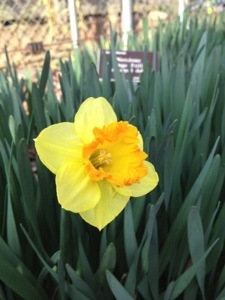 Many Spring plants are blooming early, as well as the Winter bloomers! 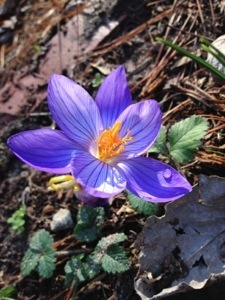 Saffron Crocus in my garden. 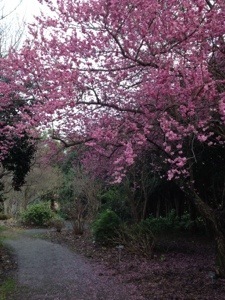 Prunus mume at JC Raulston Arboretum at NCSU. We decided to visit one of the greenways in Raleigh. My favorite greenway is what I call the Capital Swamp Greenway. 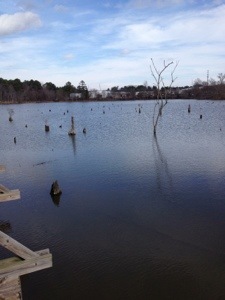 It has a boardwalk that winds through a swamp, over a large and shallow body of water next to Raleigh Blvd, under Capital Boulevard, and then heads toward Wake Forest Road. It runs along a heavily wooded section of Crabtree Creek once you leave the swamp area. Wildlife is abundant and its not crowded most days. 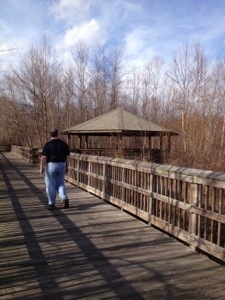 The Gazebo and boardwalk along the marsh at Capital Swamp. 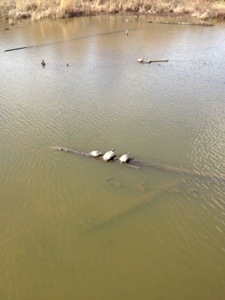 Many turtles were sunning themselves on the warm day. Looking North from the boardwalk over the open water. There is a beaver den in the background. Looking North toward Highwoods Business Park over the open water. 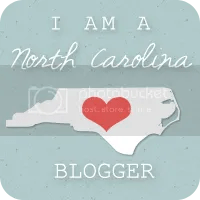 I like to park at the lot on Crabtree Blvd just off Raleigh Road inside the beltline. Its just a short walk to the boardwalk. We then walk all the way almost to Atlantic Avenue. Its about a two mile walk. There is an app you can download for free. It locates the greenways using GPS and also will track your mileage and time. The link is below. The program shows the entire 77-mile greenway system including parking and weather. There is a ‘see,click,fix’ option for reporting repairs, fallen trees, or potholes.